The elderly highlander with the thick mustache knows he must be wary of what he says. And so what if he never finished elementary school? In the streets of Livadia he has the power to change people’s minds. “We are mountain men here. We are generous and honorable, but we are also proud and will not tolerate being insulted. This often results in situations that can also lead to murder,” he says when I meet him at a coffee shop in the village. Christos Chnaris is an 85-year-old livestock farmer who has also served as president of the local agricultural cooperative. For the people of Livadia, however, he has always stood out for his ability to keep a cool head and ever since the 1960s they have been asking him to step in and solve differences between them. In this village on the southeastern Aegean island of Crete, his is the role of “mesitis,” or mediator, and for over half a century he has been striving to reconcile warring parties before they resort to violence. In every village in the region there are two or three men like Chnaris who act as local peacemakers. A fist fight, the theft of an animal, trespassing, some misunderstanding, even a scuffle between kids can set off a chain of confrontation that could escalate to violence without the mediators’ intervention. Murder is the only incident over which they cannot attempt a reconciliation. In Livadia and nearby Anogeia, as in other villages on Crete, the compromise achieved by a mediator is known as a “sasmos.” It is a process whose origins have been lost in the mists of time but it survives to this day. It is a complex institution that has become a part of the local conscience and often operates in tandem with official authorities or can even influence a court decision. 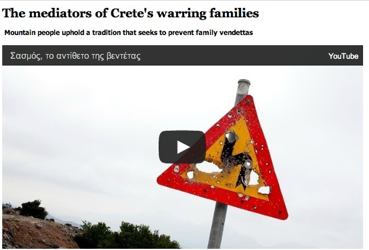 Lawyers on Crete estimate that the mediators help avert dozens of crimes every year. Three years ago at Amari in Rethymno a man shot and injured another man in the knee during an argument between their two families. By the time the case went to court, the families had reached a reconciliation. The court imposed a smaller sentence on the defendant, finding him guilty of assault rather than attempted murder.